Every time when people say food at which state are good or places at which state are nice to hang out, yes I do not deny they are good but still I love them all in my island the most; not because of they are not good at other states compare to Penang, it's just I use to everything in my island, that's what I call it home. Whao, I just couldn't believe I write it this way. Plenty of events/contests are held in this island from early of the year until year end, don't worry of getting bored in this island, you should just worry how you get more time to participate in those events/contests. Sometimes shopping malls will have small contests for shoppers so that consumers not only spend money on their needs but also the chance to win away prizes from the shopping malls. Something big, meaningful and fun is coming its way in 1st Avenue Mall Penang now and the event is I ♥ George Town, something quite suit me right? You can get the leaflet and car sticker as shown in the photo from 1st Avenue Mall at Info Counter (ground floor), the contests started when you got yourself the car sticker! My car full of stickers now and then but lovely as long as those stickers didn't block your view while driving. How to participate the contests to win yourself prizes from 1st Avenue Mall? Basically there are few ways and I'll write it here in case you can't read them in the photo. 1. Selfie & Win LAH! Redeem a FREE "I ♥ George Town" tote bag when you purchase RM150 and above in a maximum two combined receipts, exclusive only at 1st Avenur Penang. Stand a chance to win RM500 worth of H&M, Padini Concept Store, Charles & Keith, Cotton On & Hush Puppies Apparel vouchers when you snap your OOTD (outfit of the day) with your tote bag. Bonus points will be given for the most stylish fashionista. Winners will be announced at the end of October. Now, only the first contest is carry on in 1st Avenue Mall, you may follow their facebook page for more details on how to participate on the OOTD contest. Get excite from the prizes part? Wait no more, just go to the mall and get your car sticker now to participate the contest! Good luck and hope you get the prizes home with you. 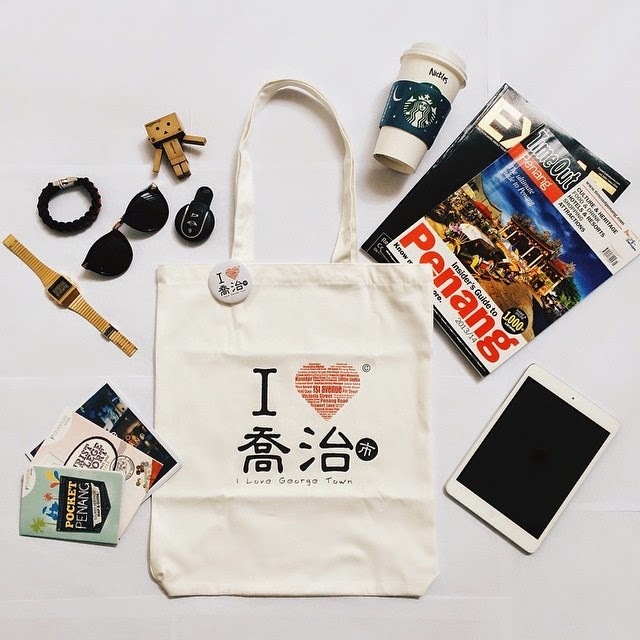 Here's the sneak peek on the "I ♥ George Town" tote bag (photo taken from here), I want it so badly but normally I just keep all the tote bag I got for collection. So it's a yay or nay? A big YAY for myself! For more information, please follow 1st Avenue Mall Penang official Facebook page here and good luck! Don't say I bojio because I'm jio-ing you guys to join this contests/events. Short trip! Short trip! Yippy yeah yeah!